Millions of adults and children alike are addicted to chocolate. The U.S. alone consumes over 2 billion pounds annually, which adds up to over 11 pounds per person. The vast majority of chocolate consumers know that its high sugar content leads to obesity and that it is also linked to migraines, acne, dental cavities, heartburn, and coronary problems. Frequent consumption of chocolate leads to addiction and, once this has set in it can take more than mere willpower to stop. Perhaps your client only resorts to chocolate binges when they are depressed, or maybe they are one of those who secretly knows that they are a chocolate addict and frequently go on chocolate binges. 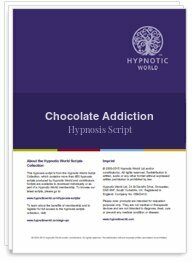 Whichever your client is, you can help them to melt away those cravings with this wonderful hypnosis script download from Hypnotic World. This Chocolate Addiction script uses powerful aversion imagery to ensure that you will overcome your addiction to chocolate once and for all.